Convey your heartfelt Raksha Bandhan greetings to every one you adore by sending this Auspicious Silver Plated Rakhi and Cadbury Celebration for Kids with Love to invigorate happiness into their lives. This Rakhi bring a smile to your Kid Brothers face by sending this Smart and 1 Silver Plated Rakhi with Cadbury Celebration Pack. This Rakhi bring a smile to your Kid Brothers face by sending this Smart and 2 Silver Plated Rakhi with Cadbury Celebration Pack. 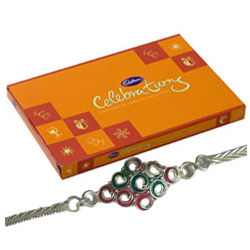 This Rakhi bring a smile to your Kid Brothers face by sending this Smart and 4 Silver Plated Rakhi with Cadbury Celebration Pack.